A ministry of the Ouachita Baptist Association to provide quality theological and ministry training for churches in the Ouachita Baptist Association and beyond. 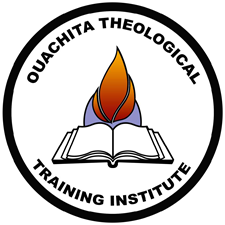 Affiliation: The Ouachita Theological Training Institute (OTTI) is a ministry of the Ouachita Baptist Association, 1201 College Drive, Mena, Arkansas 71953. Purpose: The Ouachita Theological Training Institute exists to provide quality Biblical Studies and Theological training for existing and future pastors and church leaders and to equip lay leaders in church leadership positions to be better prepared in their ministry. As Southern Baptists, we do not believe that any program or degree is required to serve in the Kingdom of God. However, we believe that completing a program of study can show evidence of a desire to be better equipped as servants through competence in biblical, theological and practical ministry areas of knowledge. Doctorial Statement: The Ouachita Theological Training Institute has adopted the Baptist Faith and Message as adopted by the Southern Baptist Convention in 2000 as our doctrinal statement. All employed and volunteer personnel, teachers, and leaders of OTTI must be in agreement with this statement. Theological Training Outcome: In order to encourage our students along the way we offer two levels of Theological training. The first level is the Certificate Program. The Certificate Program is designed to enhance the biblical, theological and practical knowledge of our students while emphasizing immediate, practical, and active application. This level allows students to complete a course of study to be better equipped in an area of ministry in the local church without the commitment of time it takes to complete the Diploma Program. The two certificate courses of study are: Certificate in Biblical Studies and Certificate in Christian Education. The second level is the Diploma Program. The Diploma Program requires a greater commitment, offers the greatest amount of flexibility, and the greatest satisfaction. Students who complete these programs will be well-rounded and well-prepared for service in the local church. Students who enroll in this program want in-depth theological and specialized ministry training. This program requires a greater commitment, but allows some flexibility in that this course of study offers a variety of options. This level currently offers two diplomas. Since it is a diploma level, in some cases these courses can be transferred to receive college credit in colleges who will accept them. The two Diploma Courses of Study are: Diploma in Biblical Studies and Diploma in Ministries/Pastoral Education. Whether our students complete one course or a program of courses, we believe that their lives and ministries, and local churches will be enriched through the process. For additional information, contact the Ouachita Theological Training Institute by phone, 479-394-3534, or email at obabaptist@sbcglobal.net.